"Auld Reekie is going mobile!" and a sneak peek of the real tour. 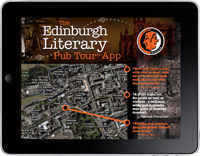 Listen to the witty dialogues of Clart and McBrain while you walk the streets of Edinburgh, browse the maps, read the script, take a snapshot and post it online to your preferred social network. This tour will be available and accessible to anyone with a smart phone or ipad, 7x 24. The app will be available for download in Apple AppStore. Follow us on Facebook and stay tuned to more news from the Self-guided Tour.